A great white shark about 6 feet long and 150 pounds was caught by a fly fisherman off La Jolla last week. It’s believed to be the first great white taken off the California coast using a fly rod and reel. Jeff Patterson, director of sales for reel manufacturer Abel Automatics, was testing company products about five miles offshore when the white shark hit. “The grab was instantaneous, and the shark cooperated with a quick left turn to allow the proper hook set,” said Patterson. The fight lasted about 25 minutes. Patterson thought it was a mako shark until he got it close enough to the boat and skipper Conway Bowman identified it as a great white. It is not legal in California to take great white sharks, which have been protected in all state waters since Jan. 1, 1994. 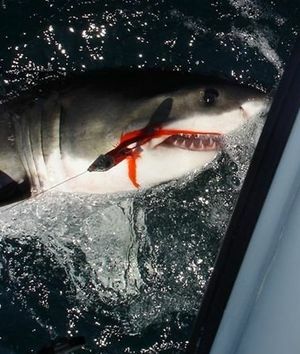 “Anglers cannot target great whites, and if caught accidentally while fishing for something else you have to immediately release them,” Department of Fish and Game marine biologist Carrie Wilson said. Patterson released the shark after taking the picture shown here.